I mentioned early in my Credit Karma, Quizzle and Credit Sesame comparison post that the strength of Credit Sesame, the latest provider of free credit score, is in the home loan area. Because Credit Sesame has a large database of mortgage providers, it’s able to run through thousands of scenarios and find the best offers for existing homeowners who want to lower their monthly mortgage payment. Now there is a new way to take advantage of this service from Credit Sesame, even if you are not a customer of it. 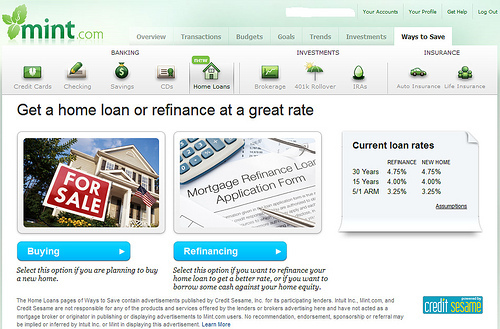 Mint.com, a popular money management website, is now offering home loans through Credit Sesame. To access the service, you can log into your Mint.com account (mint.com is free to join and use if you don’t have an account) and click the Ways to Save tap on top and you will see the screen as above. Depending on your needs, you can choose either Buying (if you are planing to buy a new home) or Refinancing (if you are looking for a better rate) from the Home Loans page. 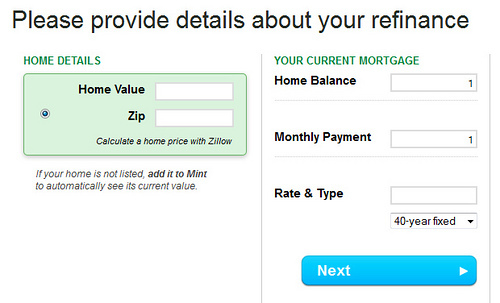 Since I already have a mortgage, I selected Refinancing in my test to see how it works. The process actually is very simple. On the next page, I was asked to provide some basic information of my current home and loan, such as the value of the house, loan balance, monthly mortgage payment and term and rate of the existing loan. You also need to provide your Zip code in order for the program to calculate an estimate of your home value using Zillow and find mortgage lenders in your area. When done with this page, you can go to the next page to provide additional information such as income, credit score and how long you plan to live in your current home. With home and mortgage info entered previously, you are now ready to what Credit Sesame has to offer. As I mentioned in the Credit Sesame review post, since Credit Sesame is still quite new, there are areas of improvement in terms of products and services provided to it customers, as we have seen a lot of improvements at Credit Karma over years. Even though the service offered through Mint.com isn’t as comprehensive as what I get from Credit Sesame directly (for example, I can customize the loan selection page so that a better offer could be found), I think teaming up with Mint.com, which has millions of customers already, can improve Credit Sesame as it can now reach more customers and will have more data to analyze.